No need for a surname, Cher is a world recognised figure as the Goddess of Pop. She is one of the best-selling music artists of all time, having sold more than 100 million solo albums and is the only artist to date to have a number-one single on a American Billboard chart in each of the past six decades. In her acting career Cher has won an Academy Award, a Grammy Award, an Emmy Award, three Golden Globe Awards, and the Best Actress Award at the Cannes Film Festival. Her other ventures have included fashion designing, writing books and managing a film production company. Anyone of Capricorn Research’s generation will remember her arrival on the scene as part of a duo with Sonny Bono. Sonny was a popstar, record producer, actor and politician. Sonny and Cher’s first number one hit was ” I Got You Babe ” which Sonny wrote, arranged and produced. Sonny and Cher were also husband and wife and this was a partnership that catapulted both to stardom, in Cher’s case on a global level. Sonny and Cher sold 40 million records together and in the 70s performed together in a number of TV shows that combined music and comedy. The most interesting thing about their charts is that they both have an opposition between planets in the 1st and 7th houses that forms part of a T Square. In Cher’s case it is between the Moon in Capricorn in the 7th and Saturn in Cancer in the 1st which projects onto an apex Jupiter. In Sonny’s case it’s an opposition from Mars in Libra in the 1st to Uranus in Aries in the 7th projecting onto an apex Pluto in the 10th. Another interesting factor is that these two T Squares aspect each other as all the planets involved fall between 18 and 28 degrees of the Cardinal signs. The synastry between Sonny and Cher was very powerful. Cher’s Sun at 29 degrees Taurus is closely square Sonny’s Sun at 27.30 Aquarius. Her Ascendant at 10 Cancer is square his at 6.30 Libra. Sonny’s Moon is very closely conjunct Cher’s Mars and Cher’s Moon is square to Sonny’s Mars. These contacts would act as a powerful magnetism between the two but its interesting to note that the aspects between the two charts and also the aspects for relationships generally for each of them are quite challenging and difficult. Cher’s Moon in Capricorn in the 7th indicates someone who would have relationships with people quite a bit older than themselves and Sonny was 11 years her senior. The Moon in Capricorn opposite Saturn in Cancer would point to someone who has had quite a difficult childhood and who has missed out in terms of their relationships with their parents, particularly the father. Cher’s father, John Sarkisian, was an Armenian truck driver with drug and gambling problems, and her mother, Jackie Jean Crouch, was an occasional model and bit-part actress with Irish, English, German, and Cherokee ancestry. Cher’s father was rarely home when she was an infant, divorcing Crouch when Cher was ten months old. In all Cher’s mother married 8 times, 3 times to Sarkisian. The third of Crouch’s eight marriages was to actor John Southall. Although her mother’s romantic relationship with Southall ended when Cher was nine years old, she considers him her father and remembers him as a “good-natured man who turned belligerent when he drank too much”. At one point Cher’s mother had to put her in an orphanage for several weeks an experience that both found traumatic. 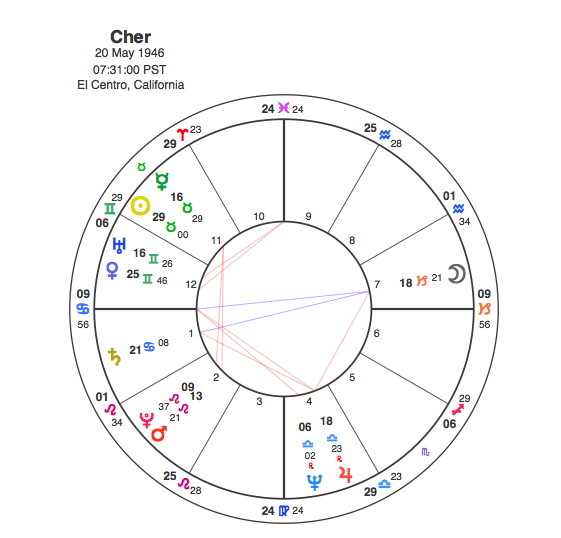 That this period was a turning point in Cher’s life is confirmed by Pluto transitting square to her Sun from 1955 to 58. So with this experience and the Capricorn 7th house Moon opposite Saturn coupled with a Taurus Sun, Cher would be looking for a partner that could bring her stability and security and material success. The planets that make up Sonny’s 1st / 7th house opposition are Mars in Libra and Uranus in Aries, a very different combination to Cher’s Moon and Saturn. Sonny would definitely be looking for excitement and an unusual and eccentric partner. Sonny first met Cher when she was 16, on a double date in 1963. Cher and her girlfriend took their dates to a lesbian bar and proceeded to dance together. Although Cher told him later that she “wasn’t that way,” Sonny saw her as a “hot-blooded paradox.” So speaks Sonny’s Mars in Libra in the 1st opposite Uranus in the 7th. Cher has said that their relationship left her hurt ‘in so many ways’, but she also said she would have stayed by his side if he had managed their business affairs better. She claimed that Sonny was a terrible husband, but a great mentor, a great teacher.’ So speaks Cher’s 7th house Capricorn Moon opposite Saturn together with the practical Taurus Sun. They have both admitted that their personal relationship was not good but their professional relationship was awesome. This brings us to the T Squares. The tension between two planets in an opposition will always be powerfully thrust onto any planet that is in square aspect to both of them. 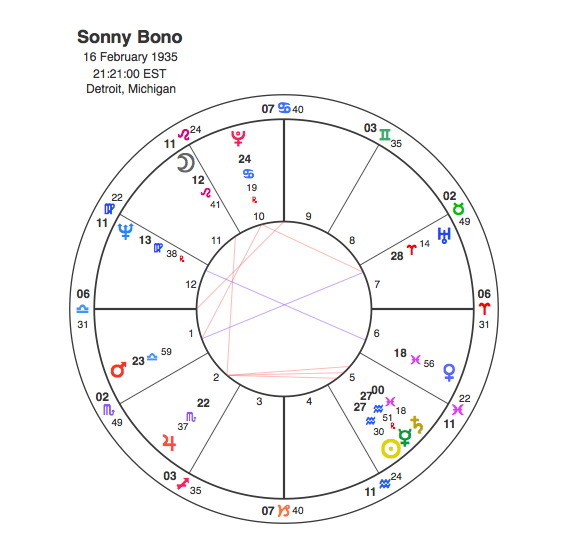 Sonny’s T Square has an apex of Pluto in the 10th, so for him the relationship with Cher brought about a powerful transformation of his career. Up until meeting Cher, Sonny had been an all round assistant and follower of Phil Spector, having written and arranged some good stuff but not having a distinct career himself. Cher’s T Square has an apex of the expansive Jupiter, which indicates that her relationship with Sonny brought her to prominence and put her on the path towards mega stardom. Jupiter’s role again shows Sonny as the mentor and teacher, the man who opened doors for her. Within two or three years their relationship began to unravel. Sonny cheated on Cher repeatedly which would be expected from Mars opposite Uranus in the 7th, T square Pluto. They still married in 1969 just after their daughter Chastity was born. The success of their comedy / music TV shows kept them together for a few years but they divorced in 1975 when Pluto was conjunct Sonny’s Ascendant and square Cher’s. Both Sonny and Cher went on to marry again but these relationships were both dominated by the oppositions in their charts. Sonny began a relationship with model Susie Coelho in 1975, this time the age difference was 19 years. Sonny eventually married Susie in 1983 but divorced the following year. Pluto was travelling through Sonny’s T square conjunct Mars and opposite Uranus between 1981 and 83. Immediately after her divorce from Sonny, Cher married laid back rock star and drug taker Gregg Allman. Within nine days of her wedding she felt it was a mistake and filed for divorce. She stayed with Allman until they divorced in 1979, when Pluto was in her T Square, in square to both her Moon and Saturn. Once Pluto had cleared his T Square, Sonny’s relationships became more settled. He married Mary Whitaker who was 26 years younger than him in 1986 and they remained together until his death. Cher did not marry again after Gregg Allman, it seemed the Moon / Saturn opposition continued to restrict her in terms of relationships. Cher’s acting career took off during the 80s whereas Sonny’s took a strange turn towards politics. 1988 was a turning point for both of them. Sonny became Mayor of Palm Springs in 1988 with Pluto ( complete transformation ) square his 10th house ( of career ) Leo Moon ( to become a mayor ). The same year Cher won an Oscar for best actress in Moonstruck and appeared at the ceremony in a negligee outfit, danced onstage and was applauded for her daring. Pluto was square to Cher’s Mars at the time and the importance of this transit is emphasised by the fact that the two planets were in conjunction natally. This was undoubtedly the peak of her fame although she has remained a big star even into her late sixties. For Sonny, the T Square that brought him and Cher together eventually indicated his death. Difficult aspects between Mars and Uranus have always been seen as accident prone. When Pluto is the apex of a T Square between these two the likelihood of dying in a serious accident is suggested. On April 7th 1998, Sonny Bono tragically died in a skiing accident. Pluto was not the transiting planet this time but both Saturn and Mars were conjunct his Uranus, opposite his Mars and square his Pluto. The transiting Uranus was also opposite his Moon. As a couple Sonny and Cher may have had their issues but both were inevitably drawn to each other in order to provide the powerful drive towards the apex of each T square. Their charts and their lives together are a fascinating study of the T square aspect itself. The tension in their private lives generated by oppositions from the 1st house of the self to the 7th house of the partner was powerfully directed into their careers and their public life. ” I Got You Babe ” ? It depends how you look at it.